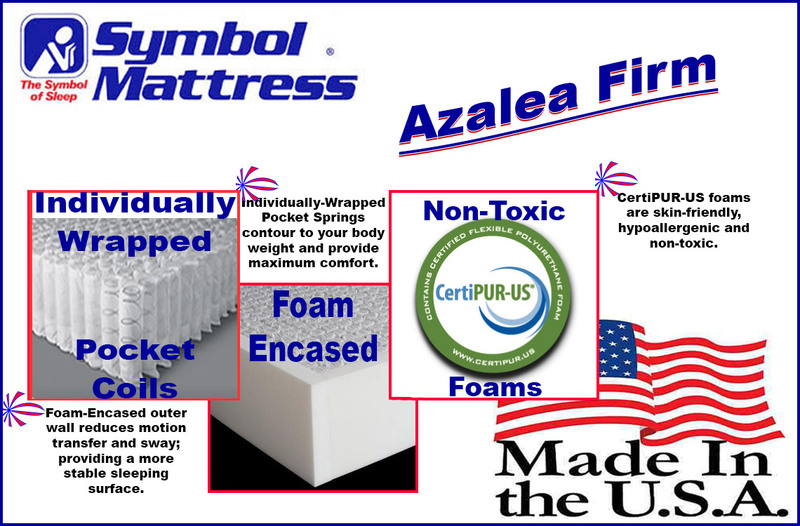 The "Azalea Firm" - new, by Symbol Mattress - is one of the better bargains that you'll find on the sleep products market. Falling into the category of "luxury firm", it's a high quality, individually-wrapped pocket coil with several high-demand features. Symbol's 840-Coil innerspring system (queen count) is just high enough to provide optimal contouring comfort and just low enough to be manufactured with a lower-gauge (stronger) support system. The Tencel cover helps to whick moisture, stays a bit cooler than conventional mattress covers and has anti-microbial properties. A perfect combination of super soft top layer, convoluted foam and High Density support foam give you a firm sleeping surface that is built to last. The high density, foam encased edge decreases motion transfer. Zoned foam provides support where ou need it most. 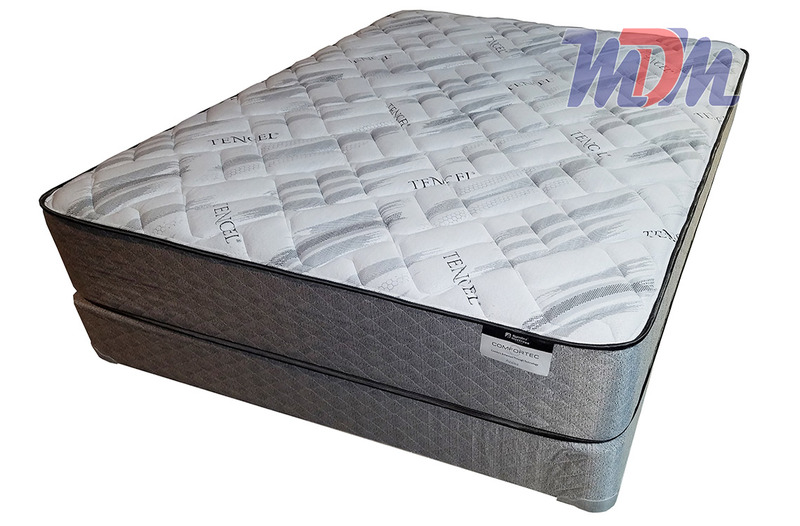 Symbol Mattresses are built in the United States (Wisconsin) and feature their own foams; most import their foams from elsewhere. They are also CertiPUR-US certified. When you hear the term "luxury firm", it most always means 'firm, with a pocket coil spring unit'. It also usually means that the mattress is going to be expensive. That's precisely what the Symbol Azalea Luxury Firm is - a pocket coil - but, an expensive mattress it's not. This is one of the better bargains that I've seen and, the mattress feels great! The Azalea touts a respectable coil count. Any higher would mean that we're dealing with a weak spring unit. Any lower would translate to compromised comfort. The Azalea combines both durability and luxurious comfort into the same mattress - for just over $500. (Queen). Zoned foam means that you'll have more reinforced support in the most important areas. A very dense edge (foam encasement) works toward eliminating motion transfer and helps to provide a peaceful sleep. 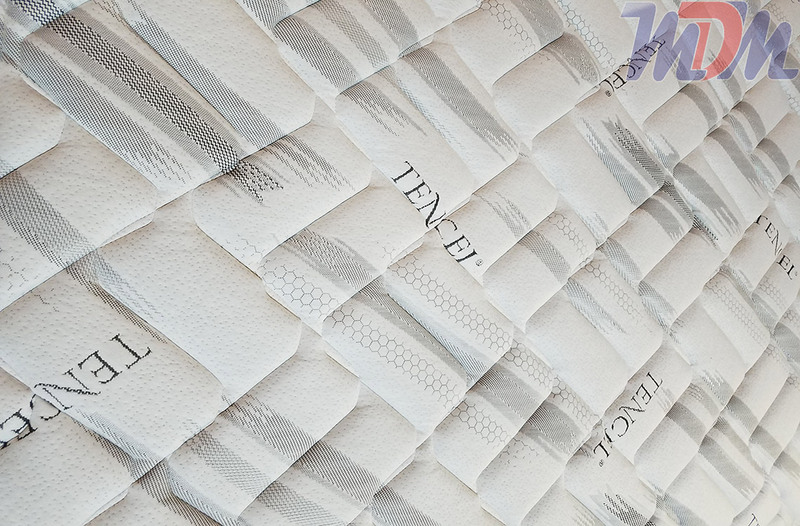 A Tencel cover helps the mattress to stay cooler, healthier (for you) and downright more comfortable. I'd highly recommend this mattress to anyone who's seeking a firmer mattress but who would prefer one that contours to their body weight. Completely made in the USA, Symbol manufactures their own foam right here in the US - in Wisconsin. For a slightly firmer feel (something that has less 'give'), I'd recommend the Stafford Extra Firm Mattress by Symbol.